Piazza Borghese is one of the squares in the historic centre of Rome (Italy), in the rione Campo Marzio. The square lies between Via di Ripetta and Via Fontanella Borghese in an area owned for centuries by the House of Borghese. tt is delimited by Palazzo Borghese at north-east, by the Palazzo della Facoltà di Architettura at north-west and by the so-called Palazzo della Famiglia at south-west. The Borgheses settled in the area in the 16th century. Under Pope Paul V (1605–1621) and cardinal Scipione Borghese, they expanded into the area between Via di Ripetta and the church of Saint Jerome of the Croats. The square was a private space adjacent to the family's palace until 19th century. 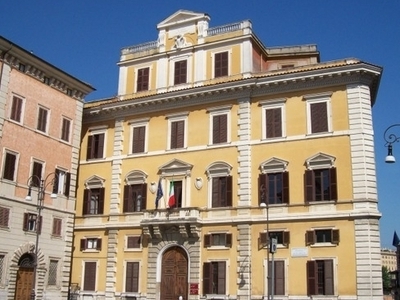 The square formerly overlooked Via di Ripetta, but between 1923 and 1928 that side was closed by the palace that now hosts one of the seats of the Architecture Department of the Sapienza University. Here's the our members favorite photos of "Plazas and Squares in Rome". Upload your photo of Piazza Borghese!